If you have an Nvidia graphics card on your system, then its recommended to install the official drivers provided by Nvidia. The proprietory drivers would utilise the hardware properly delivering full performance. Installation is pretty easy and it uses a ppa repository. So you do not need to compile anything. However, make sure to follow the steps properly. 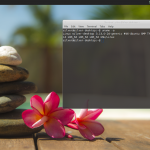 These steps would work on Ubuntu and close derivatives like Xubuntu, Kubuntu, Lubuntu and also Linux Mint and Elementary OS. Fill in the details about your graphics card and system and then click Search. On the next page, it should tell you the correct driver version with a download link and additional information. For the above GeForce 210 card, it showed 331.67 as the correct driver which can be downloaded from the website. However we shall install the drivers from ppa to make things easier. 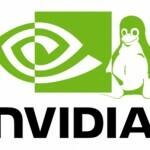 The xorg-edgers ppa provides the very latest nvidia drivers. Run the following commands to set it up. Now the ppa is setup and the package information is also updated. Either you can install the driver directly by installing a single package containing "nvidia" and the major version number ( 173, 304, 310, 313, 319, 331, 334 or 337). Or you can enable it from the "Additional Drivers" section. This is different on different Ubuntu flavors. If you have synaptic package manager installed, then go to Settings > Repositories > Additional Drivers tab and select the correct nvidia driver, and click Apply changes. If you are running Ubuntu unity desktop, simply launch the dash and search for "driver". Then click the application named "Additional Drivers". It will launch the same dialog box as shown above. Go to "All Settings > Additional Drivers" and you should see a list of all available nvidia drivers ready to be installed. Select the correct driver and click Apply Changes. The new driver would be downloaded, installed and configured for use. Go to System Settings > System Administration > Driver Manager and select the nvidia driver there and click Apply. After the installation is complete, reboot the system. You should see an option called "Nvidia X Server Settings" in your applications menu. From there you can check information about the graphics card and configure it. The OpenGL renderer string should be anything other than "MESA". Then it indicates that the hardware drivers are being used for hardware acceleration. 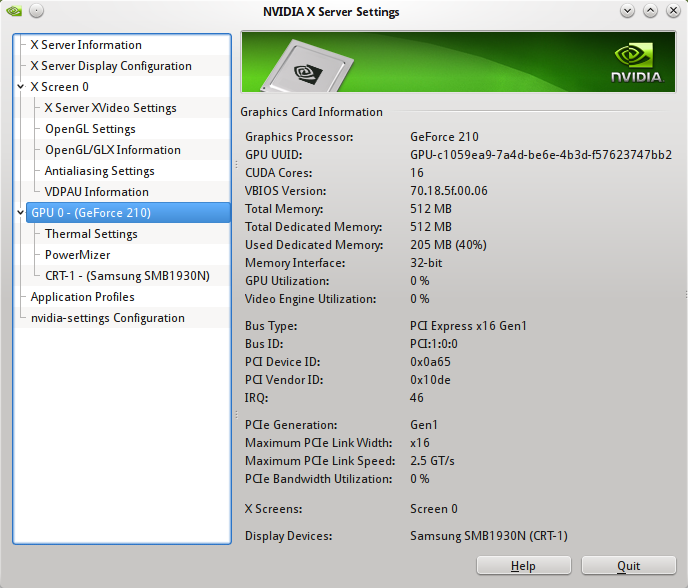 Nvidia would install a gui tool called "Nvidia X Server Settings" somewhere in the menu. It can also be launched from the command line using the command "nvidia-settings". The tool shows miscellaneous information about the graphics card and the monitor connected, and also allows to configure various options. The tool allows to configure the resolution of the monitor. If you are using dual monitors for example, then you can configure the monitor positions as well. Incase anything goes wrong after the installation, like you are not able to boot Ubuntu, then try removing the Nvidia drivers. Many tutorials out there talk about blacklisting the nouveau driver. This is no longer necessary, since the nvidia driver would blacklist nouveau itself. This can be verified by checking the contents of nvidia driver files in the the modprobe.d directory. Note that the files "nvidia-331_hybrid.conf" and "nvidia-graphics-drivers.conf" have blacklisted nouveau. The kernel module file for the nvidia driver is located at "/lib/modules/3.13.0-24-generic/updates/dkms/nvidia_331.ko". Note that it is a "dkms" module which means, its loaded dynamically. Due to this the grub screen, the Ubuntu/Kubuntu splash screens would have a low resolution since at that time the nvidia drivers are not in effect, and whatever resolution is available via the VESA extensions, are used. So how would you do this if you run KXStudio from a USB, but can’t open a terminal because KXStudio loads the wrong video driver at startup? Problem. IF I install the new card, the CPU will recognize it, I can enter the BIOS set-up, Diagnostics, etc. BUT, Xubuntu will not display, as the OS does not recognize the card. Downloaded the driver for the new card, but upon trying to install, the install program tells me that I do not have any hardware installed that need this driver, so installation fails. So, I can’t install the driver(s) until I have the card installed, but I can’t see screen display with the card installed because the drivers are not installed.